Thank you Bruce and Carol for helping make these photographs possible as we commemorate Remembrance Day 2018. 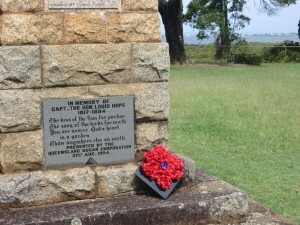 Poppies for the Poppy Appeal will be available at Historic Ormiston House today. Disney Day is almost here! 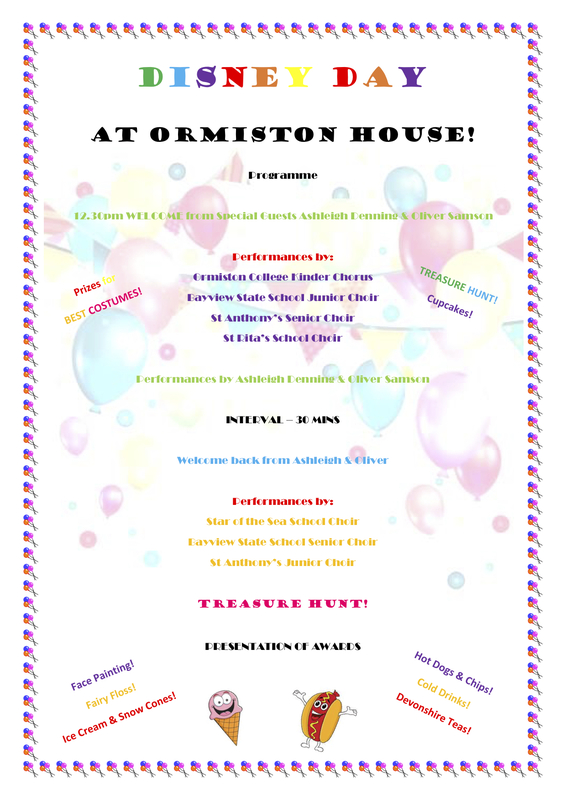 Disney Day at Historic Ormiston House is nearly here! Come and support Historic Ormiston House on Sunday 28th October while you enjoy great music from vocalists Ashleigh Denning and Oliver Samson, Ormiston College Kinder Chorus, BayView State School Junior Choir, St Anthony’s School Alexandra HillsSenior Choir, St Rita’s Primary School Choir, Star of the Sea Primary School, Cleveland Choir, BayView State School Senior Choir, St Anthony’s School Alexandra Hills Junior Choir, a treasure hunt in the grounds, face painting, fairy floss, snow cones, ice cream and hot dogs! What a fantastic day out. Admission into the grounds is $7 adults, $5 concession and $2 kids aged 5-12 years. 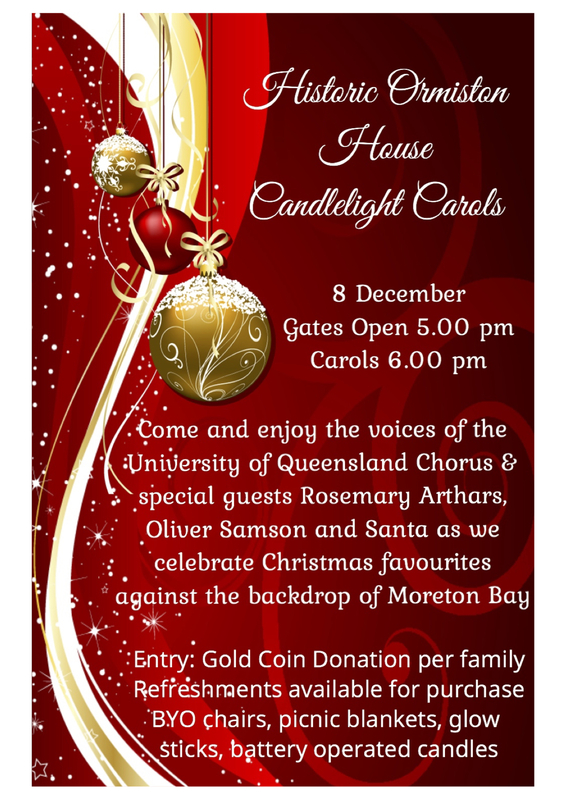 Check out all the details here and call 0457 675 137 or email administrator@ormistonhouse.org.au for any queries! 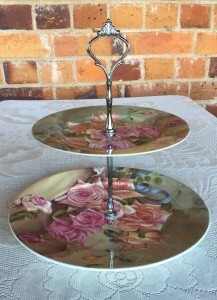 4 Tickets available for the Spring High Tea! A table of 4 tickets for the Historic Ormiston House Spring High Tea on Sunday has become available! If you thought you had missed out on this exciting event, then this is your chance to join us for this fantastic day out! Come and join this tour of the beautiful Ormiston House Gardens! Soak up the atmosphere as you view the gardens and hear about their historical and horticultural significance. The event kicks off at 10.30 am, and your ticket entitles you to stay in the grounds until our closing time at 4 pm. Why not stay for the afternoon and make a day of it? Purchase a Sandwich on the verandah for lunch, or bring your own picnic lunch to enjoy in the grounds, and keep exploring the historic house and gardens all afternoon! Tickets: $25 per person (includes Devonshire Tea). Bookings essential. Call 0457 675 137 or email administrator@ormistonhouse.org.au to book! Please note: Unfortunately, due to predicted weather conditions for this Sunday 26 August, the Choral Showcase has been cancelled. 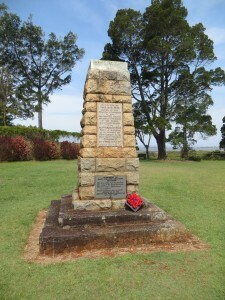 Historic Ormiston House and grounds will still be open from 12 noon to 4 pm. If you have any queries, please call 0457 675 137. Please note: The Ferrari Concours has been cancelled. For any queries, please call 0457 675 137. Historic Ormiston House and the beautiful grounds will still be open on 9 September from 12 noon to 4 pm. Please note: The Mercedes Benz Concours has been cancelled. 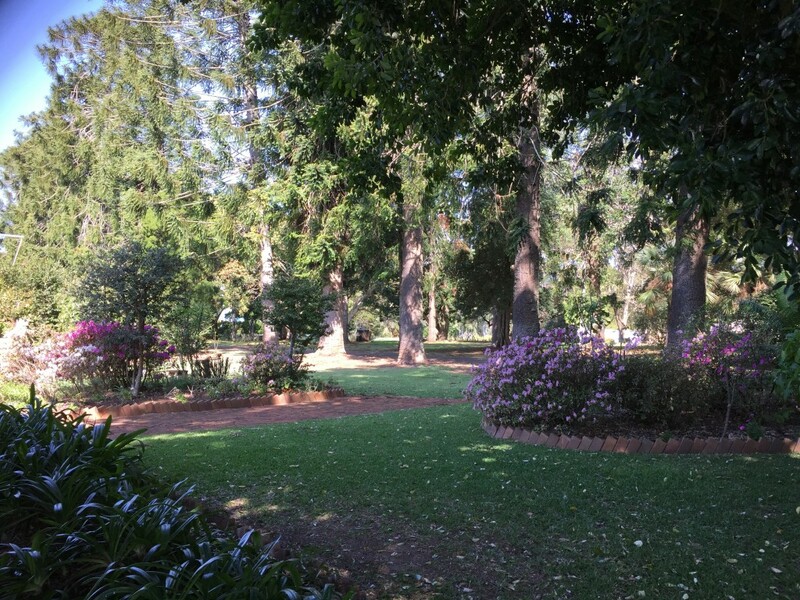 Historic Ormiston House and the beautiful grounds are still open today from 12 noon to 4 pm. Rolls Royce Concours d’Elegance is almost here! It’s almost here! 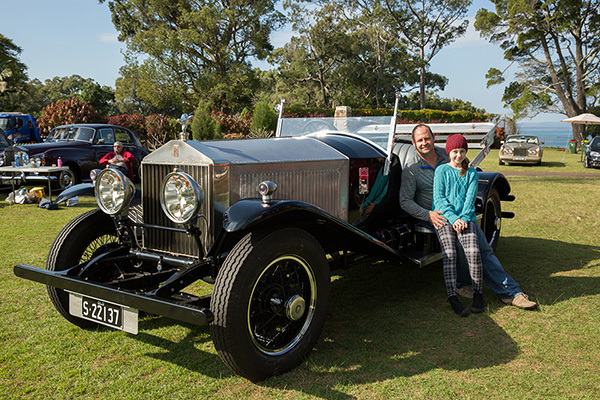 Come along to the Rolls Royce Concours d’Elegance at Historic Ormiston House this Sunday, 22 July for a fantastic day of bay views, Devonshire Teas, sandwiches, amazing cars, the beautiful historic house, and another visit from Joe’s BBQ RIBS! 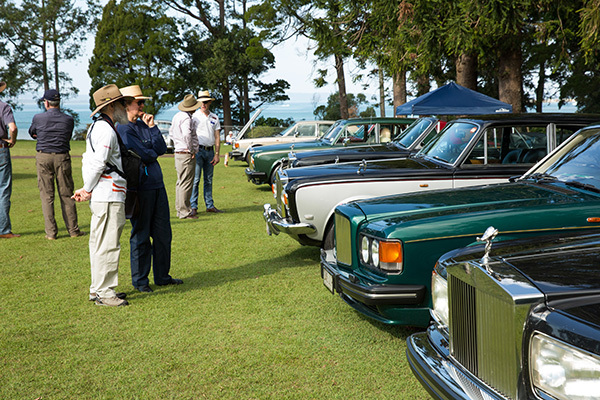 We can’t wait to welcome Rolls-Royce Owners’ Club of Queensland and all of our guests to this exciting day! Gates open at the special time of 10.30 am, and we close at 4 pm – but don’t forget, if you want to see the cars, make sure you arrive before 2 pm. Entry into the grounds is only $7 adults, $5 concession and $2 children aged 5-12 years. Devonshire Teas on the verandah are only $5! If you fancy something a bit different, we also have sandwiches available on the verandah, or wander over to see Joe and Laura from Joe’s BBQ RIBS for something delicious! Give us a call on 0457 675 137 for any queries! It’s almost here! This Sunday from 10.30 am come along to Historic Ormiston House to see the display of Vintage Cars for the Vintage Car Club Day! Around 60 cars are expected to be displayed against the backdrop of beautiful Moreton Bay – how fantastic! Check out this article from the Redland City Bulletin about this exciting event. Gates open at 10.30 am and cars will be available for viewing until 2 pm. Why not enjoy a Devonshire Tea or a sandwich on the verandah after viewing the cars? Or you can enjoy some American chilli or a beef brisket brioche burger from Joe’s BBQ RIBS who will be onsite until 2 pm. Perfect for a chilly winter’s day! The Ormiston House grounds will remain open until 4 pm. We can’t wait to welcome you to this exciting day! Call 0457 675 137 with any queries ??? ?